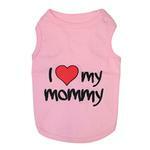 Dogs will show who they love most with our I Love My Mommy Dog Tank in Pink! Share your pet's fun side with this adorable graphic tank from Parisian Pet! This tank is a comfortable, breathable high-quality 100% cotton interlock with a fun embroidered saying! Everyone knows a dog's devotion is unmatched, and this tank is a great way to show it. 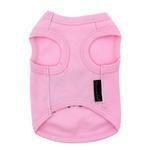 The exceptional quality of this tank will give your dog some love back with its luxurious feel. This shirt makes a great gift for Mother's Day! It's also an appropriate choice for dogs that are soothing their "mom" during health struggles. This dog tank top is machine washable. Since the garment is 100% cotton, we recommend drying flat to prevent any shrinkage. 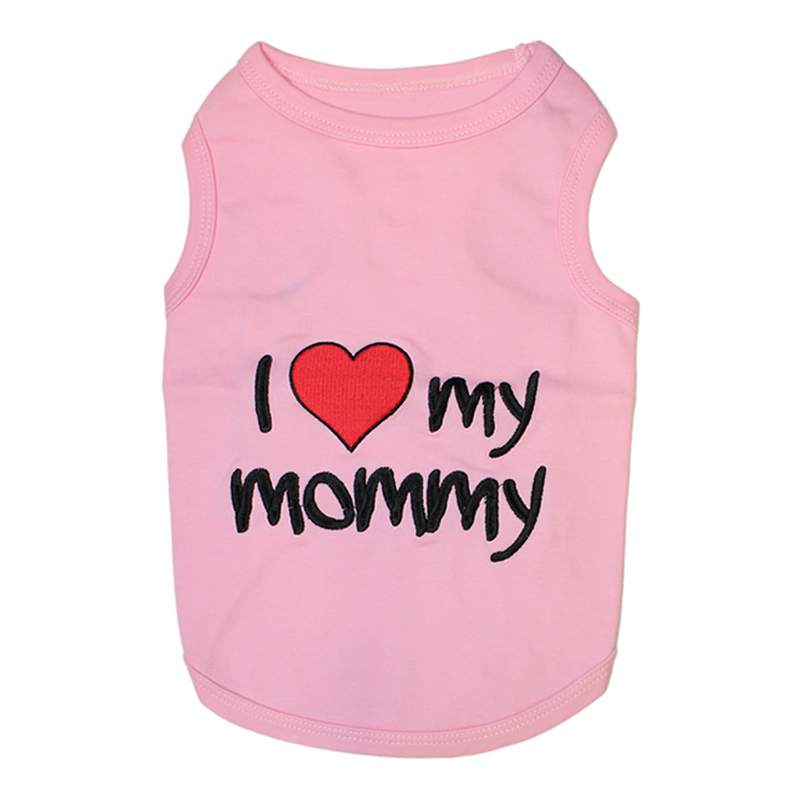 I Love Mommy Dog Tank - Pink Customer Photos - Send us your photo! This is Khloe, a one year old Dachshund mix. She's always happy, smiling, talking, and best of all she loves her mommy! Molly loves her new tank! It's light weight and perfect for an afternoon nature walk! Posted On 05/17/18 by Sara F from Jackson , MI Yes, Sara F recommends this product! I love this little shirt! The fabric is very soft, but also very well made. I have ordered items from Parisian Pet before & have always been very satisfied! I have found that they do run small though, so be sure to measure your baby before ordering. My 8 lb. mini Doxie usually wears a small, but in this shirt, the medium was perfect! Posted On 08/05/17 by Kathleen Y from Catawissa , MO Yes, Kathleen Y recommends this product! I have ordered 5 of these dog shirts. They are made great, there soft and wash great. I don't recommend putting them in the dryer. Like most clothing, things do shrink. My Boston Terriers wear their shirts as nighties and sleep comfy all night long. Parisian Pet products are fantastic. Posted On 07/28/17 by Jessica J from , CA Yes, Jessica J recommends this product! My little Sparkle will lol adorable in this shirt!!!! Posted On 07/21/17 by MEGA D from FORT WORTH, TX Yes, MEGA D recommends this product! How can you go wrong with I HEART MOMMY? This shirt appears very well made and fits nicely. Posted On 05/22/17 by Ana L from West Hartford, CT Yes, Ana L recommends this product! I LOVE this dog t shirt. This company always makes a thick 100%cotton t.. with sewn embroidered logo! Comfortable for my Mini Long hair Dachshunds! I put this t under Puppia harness vests .. Perfect pairing for sun protection and keeps dirt and pests off my fur baby!! Posted On 05/05/17 by Taylor E from , Yes, Taylor E recommends this product! Posted On 02/23/17 by Tracey M from , FL Yes, Tracey M recommends this product! My 8 month old Bulldog looks so adorable in this, she loves wearing it, so much that I went back and purchased 3 more for her. The sizing was exact, I followed the chart at the bottom and it was a perfect fit. Posted On 02/22/17 by Jesus M R from San Angelo, TX Yes, Jesus M R recommends this product! Posted On 12/20/16 by Sheila A from boca Raton, FL Yes, Sheila A recommends this product! Anni loves to put on her shirts when we go to bed. She looks adorable and sleeps well. Posted On 09/12/16 by Tasha B from Wagener , SC Yes, Tasha B recommends this product! Love this shirt it looks so cute on my dog and fits perfect. Posted On 07/25/16 by Joanie from PROVIDENCE FORGE, VA Yes, Joanie recommends this product! I love the "I love my Mommy" tee shirt. I know if Baby Jade could speak she would tell me this. Since she can't, she now has the second best way of relaying her feelings, and I just think it's adorable! Thank you Baxter Boo for some of the cutest shirts on the market! Posted On 07/19/16 by Patti L H from Salem, OR Yes, Patti L H recommends this product! Saw this shirt and couldn't resist! My girl shows me everyday how much she loves me, but just doesn't have the words! Now she can wear them. Love the light pink color and the high quality of the stitching. Would definitely buy Parisian Pet products again. Posted On 04/30/16 by Denise N from , NY Yes, Denise N recommends this product! EXTRA! EXTRA! HEY READ ALL ABOUT HOW I LOVE MY MOMMY. Shirt is made very well with embroidered message NOT a decal. Great quality!! Posted On 03/25/16 by ANNA S from Owasso, OK Yes, ANNA S recommends this product! Posted On 03/17/16 by Elizabeth M from , FL Yes, Elizabeth M recommends this product! My new baby Chiweenie Bella looks adorable in this! I ordered XXS and it's a perfect fit. Posted On 03/02/16 by Amie L from , OR Yes, Amie L recommends this product! Posted On 12/18/15 by Stepehen R from Port Orange, FL Yes, Stepehen R recommends this product! we purchased this for our female dog and also order 1 in gray for our male. another good product, the fit was perfect and they look great in them. Posted On 11/05/15 by Jessica L from Clinton, LA Yes, Jessica L recommends this product! This is the shirt I put on Coco Chanel when we go places, like to the doctor or to visit our friends. She is so adorable in her shirt and it makes me happy!! Posted On 09/05/15 by Diane J from Hillsborough, NJ Yes, Diane J recommends this product! I love this one because Mandy is my little girl. I am her mommy. She is a princess and this shirt fits her personality. Posted On 06/29/15 by Phyllis W from Philadelphia, PA Yes, Phyllis W recommends this product! Posted On 05/22/15 by Katherine M from Boca Raton, FL Yes, Katherine M recommends this product! Love this tank! It is very soft and a perfect fit! Posted On 05/21/15 by Joy U from LAKE CHARLES, LA Yes, Joy U recommends this product! I got one for my Helen girl, and one for my grand doggess Betty. I got to see a picture of her in it, and it was adorable. Posted On 05/17/15 by Connie S from Scottsdale, AZ Yes, Connie S recommends this product! This shirt looks so adorable on my precious chihuahua.... The sizes run big but I figured out how to alter it to fit... Absolutely love it! Posted On 04/15/15 by KATHRYN R from Rio Rancho, NM Yes, KATHRYN R recommends this product! This tank is a wee bit snug on my Yorkie but it is really cute on her. I got it for a sleep shirt but it is too snug for that. She wears it during the day. Thank You, Thank You for shipping to an FPO/AP address!!! My daughter & son-in-law are stationed on Okinawa, Japan & can't find what they need for their lab. This site had the product with EXCELLENT description & product video & SHIPPED DIRECTLY TO THEM in Okinawa!! We will be buying from this site AGAIN for my daughter's lab! !